There was no shortage of insect issues in 2018, though some pests we would typically expect were not a big problem this year. Swede midge, armyworm and even western bean cutworm for the most part were not nearly the problem they have been in the past in canola, wheat and corn, respectively. This may be due in part to natural enemies being very abundant in fields this year, but timing of planting may have also played a role. Planting early to avoid the critical time periods when the pest is expected to cause injury can be an effective method to reduce risk of certain pests. This is very important for swede midge management in spring canola but also played a role in western bean cutworm in corn this year, as many corn fields passed their most attractive stages before peak moth flight occurred. 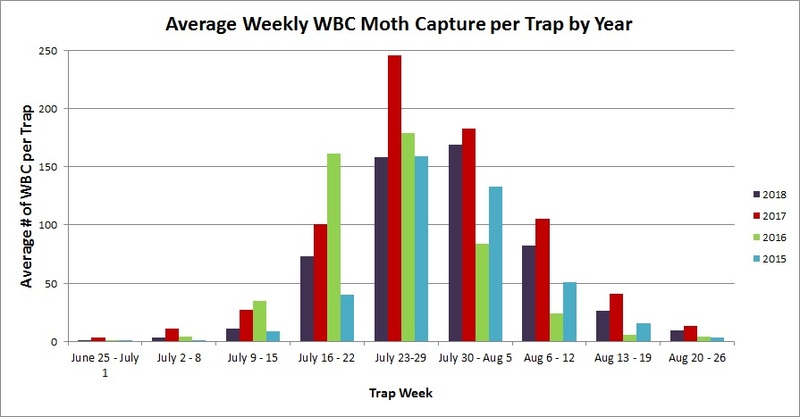 Western bean cutworm populations were lower than last year. 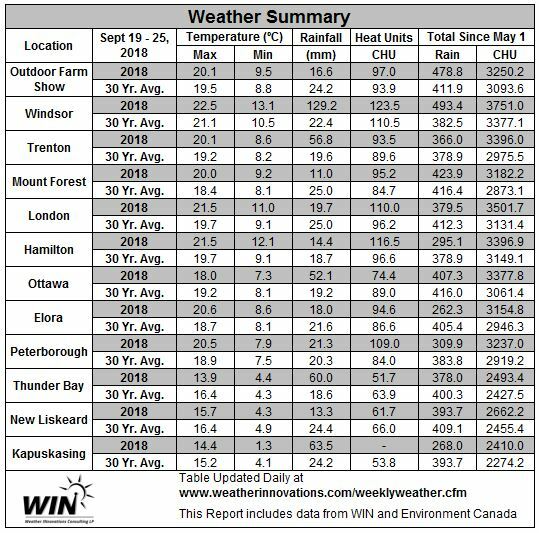 Trap counts were lower, especially in corn fields and the average provincial peak flight was one week later than in 2017 (Figure 1). This delay in peak was influenced by a shift in the geographical area that experienced higher moth captures. Typically, the bulk of the activity is in the Chatham-Kent, Lambton, Elgin and Middlesex areas. 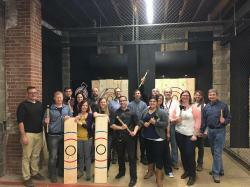 This year, the activity shifted towards Oxford through to Bruce which normally experiences peak flight a week later than the far southern counties. In general, egg masses were hard to find and fewer fields reached threshold. Unfortunately, some fields that were diligently scouted and found to have few to no egg masses prior to the fresh silk stage were found to have larvae in some ears in late summer. 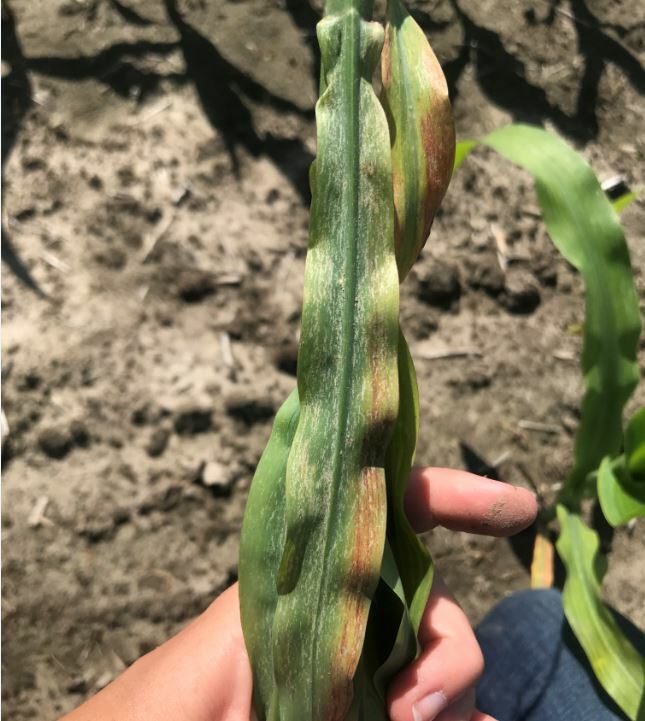 We are still sorting out why this occurred, but it could be in part due to moths laying eggs in later stages of corn than they typically would, simply out of desperation from lack of finding younger fields. What this means for spray timing guidelines will depend on what impact this had on yield and quality this fall and whether this becomes a more regular event. A few pests were more abundant and, in some cases, unexpected. Cereal leaf beetle, alfalfa weevil, soybean aphids and pea aphids reached thresholds in some fields. The aphid populations in return, may have helped build the natural enemy populations that moved into corn this year and helped reduce the western bean cutworm population. Reports of syrphid fly larvae plastering corn tassels were almost unbelievable without the photos that accompanied them. There were many fields with more than one ladybug adult or nymph on every corn plant. That is a great news story. Unexpected pests included thrips and corn rootworm. Thrips in mid V stage corn and soybeans in dry fields were actually causing enough injury to justify control in some fields (Figure 2). Thrips are typically an issue in crops at the seedling stage or at most, a concern on the lower leaves of non-pubescent soybean varieties or susceptible sweet and seed corn plants in dry years. Corn and soybean plants normally grow ahead of any thrip feeding injury, with new leaves appearing healthy and thrip free. But if there is no rain, crop growth can be delayed and the thrip population can explode. With few to no action thresholds for guidance, spray applications were recommended in only those fields that continued to have symptoms and a fair number of thrips on the new leaves. Corn rootworm adults were out two to three weeks earlier than normal. Though they are usually only a pest concern in continuous corn fields, a few adults were frequently found feeding on the silks and kernels at the ear tip in grain corn which may have increased the risk of ear moulds. As reported in last week’s crop report, field conditions were favourable for ear moulds this year, but insects like western bean cutworm and rootworm can contribute to increasing this risk by opening up the ear tips to infection. Finally, as a result of the above normal temperatures this summer, stink bugs, tarnished plant bug and spider mites kept scouts busy late into the season. These pests in particular thrive in hotter years and may become our main pest concerns as hotter summers become more frequent. Late season corn, soybean or dry bean seed damage by stink bugs and tarnished plant bugs can increase costs to grain cleaning or risk complete loads being rejected. Being present late in the season when scouting has wrapped up makes it more difficult to spot them for timely management. New registrations of foliar insecticides with shorter pre-harvest intervals will also be needed to target these late season pests, and allow us to rotate from the chemical families already used to control the earlier season pests within the same field. Insecticide resistance by spider mites, western bean cutworm and soybean aphids are real concerns facing Ontario agriculture in the near future with soybean aphids and spider mite resistance being documented in nearby jurisdictions.